Can Gen David Petraeus make an impact in Afghanistan? The Taleban is planning for a 20-year war in Afghanistan - and the US and its allies are now having to develop policies to match. The problem is that the policies carried out up till now - a combination of military operations and civilian development in the hope that in due course the Afghan government will be strong enough on its own - have led to a deteriorating security situation. The issue beyond that though is whether the strategy is right. The former European Union envoy to Afghanistan Francesc Vedrell thinks not. He told the BBC that the current strategy would not bring success and that President Bush's administration was misleading itself on the issue. He said that many mistakes had been made. In the meantime, reinforcements are now needed and a gradual shake-up in security planning is underway. 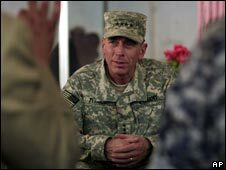 The new head of US Central Command, which oversees military operations across the Middle East and Afghanistan, is to be David Petraeus, the general who is credited with turning the war in Iraq around. Can a "mini surge" work in Afghanistan? President Bush is announcing that a drawdown of troops from Iraq will enable the US to send an extra combat brigade to Afghanistan early next year. Presidential candidates, the successful one of which will face difficult decisions in the years ahead if the war continues to be hard, are weighing in. Senator John McCain is promising three extra brigades, Senator Barack Obama two. The US is sending a senior counterinsurgency expert, Gen John Nicholson, to the south to invigorate operations there. It is interesting to note that one of his forebears was a British brigadier who raised the siege of Delhi in 1857 - with a deserved reputation for great brutality that the current Nicholson will want to avoid. Gen Nicholson's mission might herald a greater role for the US military in the south. There is also to be streamlining of the command arrangements between the Nato-led Isaf forces and the separate US forces operating under the banner of "Enduring Freedom". 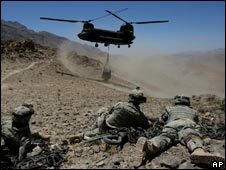 Military tactics are also under question, especially the widespread use of air power, which is needed to make up for the lack of troops on the ground. This has led to numerous disasters among the civilian population. Few Western diplomats have any faith that the Pakistani army is in a position to stop the Taleban crossing the border. Some military figures believe that Pakistani elements still favour the Taleban and there is now a lowered expectation that, at best, Pakistan can play a role in targeting individuals. The basic situation is that the Taleban itself is proving to be resilient. A journalist held by the Taleban recently said he had been told by a senior commander that, unlike the 1990s, the Taleban now knew it could not win the war in a few months, or indeed a few years. It was expecting to take 20 years to evict the foreign forces. The renewed concentration on Afghanistan comes at a time of political weakness in the Afghan government. President Hamid Karzai is seen by Western leaders as well-meaning but weak. Efforts are underway to encourage him to assert himself. And not all Nato allies seem to have the stomach for the fight. Nato planners in Afghanistan now assume that the Dutch and Canadians will withdraw from combat operations by 2010/11, concentrating instead on training the Afghan army. This itself is to double in size to 120,000 and some expectations are being placed on it for the long term. The Dutch and Canadian transition might put pressure on Britain (and a new election has to be held by 2010) to reconsider, or at least justify, its level of commitment. For the moment, British planners seem quite pleased that in Helmand province there are signs, they say, of improvement in some areas. This is put down to counter insurgency tactics that stress the need for better civilian rule (the British are great supporters of Helmand Governor Gulab Mangal, an ex-communist, who is seen as an efficient administrator) as well as military pressure. But it is going to be a long haul at best.